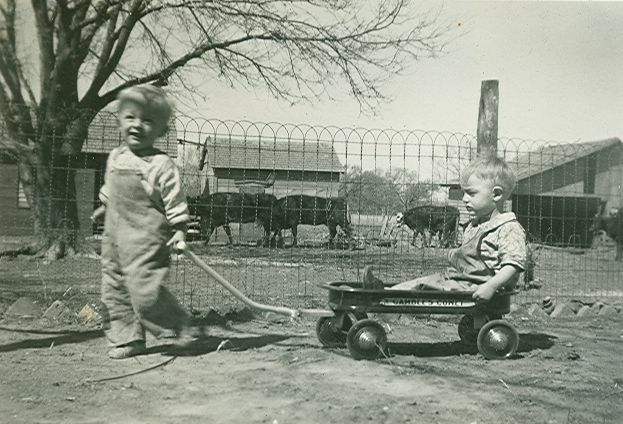 During the first seven years of their married life, 1937 to 1944, Bill and Meta Juhnke labored on the family farm and at school. Bill taught social studies at Moundridge High School until 1942, and at Buhler High School until 1944. Meta was a homemaker, giving birth to James Carlton (May 14, 1938) and Janet Ann (November 26, 1942). She also cultivated the farm garden, milked cows, raised and butchered chickens, and did other farm work. 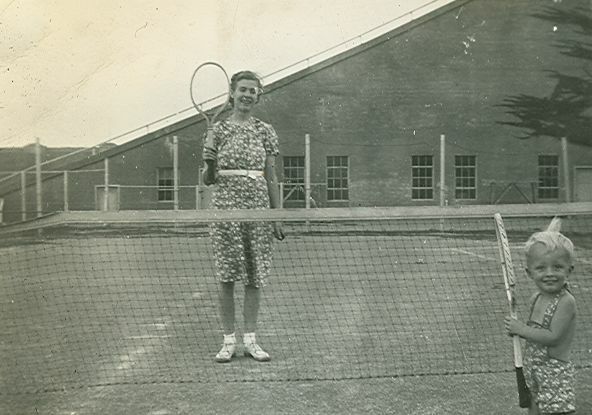 Meta and Bill attended the Eden Mennonite Church and were both active in church activities. They followed closely the great public event of their time -- World War II. The war began in Europe in September 1939, and the United States entered in December 1941, after Japan attacked Pearl Harbor. The war eventually dictated Bill's move in 1944 away from high school teaching to full time farming. Bill and Meta did not begin married life in privacy. After the evening wedding dinner and celebration at the Juhnke farm near Elyria, they spent their first night together in the home of Meta's parents, Jonas and Katie Goering. Then they moved to Juhnke farm home. Bill's parents, Ernest and Alvina, planned to move their family to a new farm home near Moundridge, but that house (the basement portion) was not ready for another three months -- August, 1937. So Bill and Meta moved into one room -- the northwest upstairs room -- in a house fully occupied by Bill's parents and six younger siblings: Elsie, Carl, Walter, John, Marie and Martha. Bill had lived in this house since he was born (except for his last two years in college), so this was no great change for him. His mother didn't even have to put another plate at the table. Meta replaced Bill's sister Alvina, who had married Abe Neufeld and moved with him to Enid, Oklahoma. Not long after the larger Juhnke family moved out in August, Abe and Alvina moved in. Their living arrangements in Oklahoma had not been adequate, so they moved to the Juhnke farm home near Elyria. For about a year, the two young couples lived together--dividing the house space and sharing facilities. If there were any tensions in these close living arrangements, Bill and Meta did not report them in oral interviews years later. It was a happy time. Meta's choice was to live on the south half of the house, because that side had the running water and toilet. Abe and Alvina had an icebox on their side, where Meta kept some milk for her first baby in May 1938. 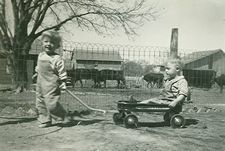 After both couples had their first children (Gerald Neufeld and James Juhnke were born just a week apart on May 7 and 14. ), the Neufelds moved out to a small house in Elyria that Ernest Juhnke had bought for them to use. Bill and Meta did not run anything like an independent farm operation until 1944 or 1945. Bill did not have his own farm tractor or other machinery. He depended upon equipment from his father and father-in-law for plowing, cultivating, and harvesting. Bill and Meta's wheat field, south of the house, was harvested after the other fields were finished. Ernest Juhnke remained the official owner of the land until 1940, according to the abstract of title. Then Bill "bought" the Juhnke land on section 26 for $3,500. (See the map from Chapter One.) Ernest planned to give each son eighty acres, and in some cases, to sell them additional land when possible. Bill eventually bought two forty acre plots from his father. Some of his siblings thought that Bill, the favored oldest son, got special advantages. Bill and Meta did have a relatively small number of farm animals--cows, chickens, and pigs--for a regular supply of milk, cream, eggs, and pork for eating. Because they moved to Lawrence, Kansas, in the summers of 1938, 1939, and 1940, they had someone else (apparently Abe and Alvina Neufeld came from Elyria some of the time) to look after the livestock while Bill worked on the master's degree at Kansas University. "We lived very prudently at first," Meta remembered. "We bought nine dollars of groceries in a month." In those days the Moundridge grocery stores advertised the following prices: beef roast for $.17 lb. ; hamburger for $.15/lb; 48 lb. flour for $1.69; 10 lb. sugar for $.49; 10 lb. salt for $.19; bananas for $.06/lb; and watermelon for $.02 per ½ lb. The twice-daily chores generally kept Bill and Meta close to home. Meta milked the cows and fed the livestock when Bill was away at high school debate tournaments and church conferences or retreats. Meta's domestic sphere also included a substantial vegetable garden. 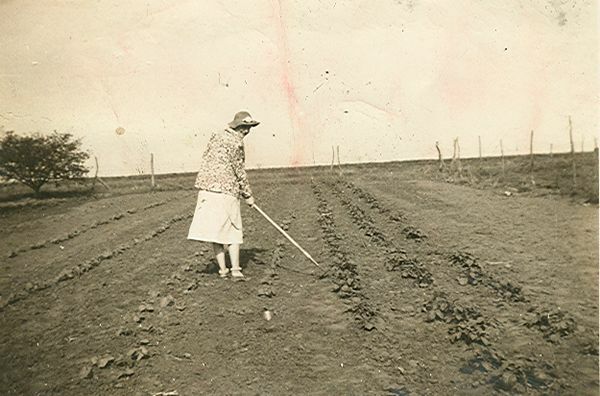 In early spring they planted potatoes, lettuce, beans, peas, and other vegetables. The garden also included poppy for the Swiss-Volhynian delicacies of poppy seed rolls, poppy seed cake, and mack plotzky. Spring rains helped produce a good crop of vegetables before the weather turned hot in June and July. Meta and her mother canned a lot of green beans. In the summer of 1940 when Meta and Bill were in Lawrence, Katie Goering reported that she had picked some beans in the Juhnke garden. She canned over a hundred quarts of beans that summer, including some for Meta and Bill. There was much social visiting in those early years. Meta spent many days at her parents' home. The Goering farmstead was just off of Bill's route to Moundridge High School, so it was convenient for him to drop off Meta (and Jimmy, after he came along) in the morning and pick her up in the afternoon. Sunday afternoons were times for visiting. An "Elyria News" section in the Moundridge Journal chronicled some of the visits. For example, from the September 16, 1937 issue: "Mr. and Mrs. Ernest Juhnke and family were Sunday dinner guests at the Wm. Juhnke home." (If the whole family came, Meta served ten people at this dinner.) "Mrs. Wm. Juhnke spent Monday at the home of her parents, Mr. and Mrs. Jonas J. Goering." In the November 17, 1938 issue: "Mr. and Mrs. Herman Schrag and family, and Mr. and Mrs. Wm. Juhnke and son were Sunday supper guests at the home of Mr. and Mrs. Abe Neufeld." And May 2, 1940: "The Elyria Dramatics Club was entertained at a dinner at the Dave T. Stucky home Wednesday evening. Guests included Mr. and Mrs. Bill Juhnke and son, . . . ." Occasionally Meta also served meals related to Bill's school activities. The Moundridge Journal for May 8, 1941 reported (without mentioning Meta or giving her any credit): "The Hi-Y cabinet and sponsor, Mr. Balzer, enjoyed a big supper at the home of Mr. Juhnke last Friday evening." Meta's church activities included participation in the ladies aid society at the Eden Church--the Dorcas Society. She was a member of the "Moundridge Study Club," a ladies literary society. In November 1938 the topic of the club's program was, "There is a woman at the bottom of all good things." Meta was one of six women who spoke on "housekeeping" in different countries. The newspaper report said, "Mrs. Wm. Juhnke spoke on ‘England.'" Meta gave birth to James Carlton Juhnke in the Bethel Deaconness Hospital in Newton on May 14, 1938. Bill took Meta to Newton in Abe and Alvina Neufeld's car, because the Juhnke car had broken down and was being repaired. According to the Moundridge High School section ("Wildcat's Claw") of the Moundridge Journal, Bill was buoyed by the birth of a son: "Young ‘Jimmy' Juhnke is the reason for proud papa Bill Juhnke's general good feeling for everyone. He struts around and is the traditionally proud young father all over again." One of Bill's freshman classes, "after a long and verbally artistic oration," gave Bill a set of different sized safety pins. Jimmy was a quite placid baby. Meta later said that when the other babies were more fussy in the nursery room at the Eden church, she thought it was because she just was naturally a better mother. Later she learned differently. One unpleasant event at church was the time that she took her baby along with her to the outside toilet--and accidentally dropped her purse through the hole and into the sewage. She got her father, Jonas, to retrieve the purse. In later years, Jimmy said he was glad that it was the purse and not the baby that fell through the hole! Bill enjoyed teaching social studies at Moundridge High School. There were about 200 to 240 students in the school, including Bill's and Meta's younger brothers and sisters, as well as other relatives. Curt Siemens, the superintendent, claimed in a recruiting letter of August 1936 (the time that Bill began teaching there) that the school "ranks with the best in the state. Vocational Agriculture, Home Economics, Business Courses, and Bible are among its leading courses in a building that is now in the best of condition." Although it was a public school, religious and biblical language came naturally. "Be wise and do not bury your talents as did the wicked and slothful servant," wrote Siemens in an effort to convince John Juhnke, an eighth grade graduate, to attend high school. The school not only offered Bible classes, but held chapel services each Wednesday. In later years Bill recalled an incident of hilarity and embarrassment that illustrated his penchant for the outrageous. At one school assembly he was called forward to give an impromptu unannounced speech about the title of a popular song, "A Pretty Girl is like a Melody." But Bill didn't know the songs on the hit parade and he had misunderstood the title for his speech. He got up and gave a speech on the topic, "A Pretty Girl is like a Melon." One of his points was that "she has lots of seeds." The speech "brought the house down." Sometimes the student reporters gave Bill credit for making serious points. A school news report of February 20, 1941, said, "We think that Mr. Juhnke 'said a mouthful' when he stated in assembly the other morning, 'Don't put your mouth in high gear unless you are sure that your brain is turning over.' Many students might take a lesson from this." Bill taught history and social studies. He did not leave a record of his teaching schedule and classes taught. Superintendent Siemens reported that most teachers taught five classes and sponsored one or two extra-curricular activities. There was an average of twenty-five students per class. Bill wrote to Dr. Carlton J. H. Hayes at Columbia University, the author of a favorite history text, to ask for a teaching guide -- and got a personal note in response. He took Dr. Hayes' first name for the middle name of his son, James Carlton. Bill brought his interest in debate and drama into his classroom, and organized student reports and simulations to represent different viewpoints. Student interest in current affairs was heightened by the war in Europe and by the prospect that the United States might initiate military conscription and enter the war. Bill had students write letters to national and international leaders -- such as the head of the Catholic Church in Austria after Hitler's invasion of Austria in 1938. On Apr. 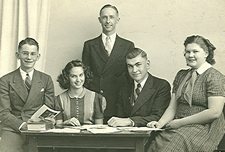 22, 1937, Bill's Kansas History class began a "Sunflower Club" that adopted a constitution and attempted "to get a better appreciation of our own state by studying local history." On Feb. 8, 1940, Bill's Economic Geography Class undertook "something entirely new" -- a unit on vocations in which each student researched and reported on a particular vocation. The class subscribed to the magazine, "Your Future." Bill's class (or extra-curricular activity) that got the most publicity was debate. In the 1937-38 school year the debate squad had fourteen members. For practice they debated at public events at local primary schools on the topic, "Resolved, that the several states adopt unicameral legislatures." Meta served supper to four debaters on January 21, 1938, before their public "practice debate" at King City school in Elyria. That school year Bill took the debate squad to four tournaments. The debate topic for 1938-39 was "Resolved, that the United States should establish an alliance with Great Britain." That year they tied for second place in the Mid-Kansas League tournament and came within three speaker points of winning first place at the district tournament. In 1939-40 the debate topic was "Resolved, that the government of the United States own and operate all railroads." A noteworthy event of that season was the Hutchinson debate tournament, when seven Moundridge debaters stayed in one room at Hotel Stamey. Bill's debate teams had increasing success over the years. In 1940-41 they won first place at the district tournament, winning nine of ten debates on the topic, "Resolved, that the power of the federal government should be increased." Floyd Krehbiel, who participated four years, was the premier debater on that squad. The team won only half their debates at the state tournament, and the top debaters were angry at the end of the season when Bill gave everyone the same award pins regardless of their number of wins. 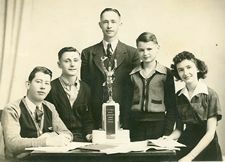 In 1941-42, Bill's last year of teaching at Moundridge, his debate teaching career climaxed when the Moundridge debate squad won the Kansas state tournament championship (Class C). The debaters that year were Carl Stucky, Leroy Goering, Gilbert Goering, and Ellen Waltner. Their topic was one of special interest to Bill as a religious pacifist: "Resolved, that every able-bodied male citizen in the United States should be required to have one year of full-time military training before attaining the present draft age." Bill took special pleasure in helping students research the various topics and build their cases on both sides of the question. At debate tournaments he worked diligently to learn about the arguments and evidence of opposing teams, and to help his debaters craft opposing responses. The debate program at Moundridge depended very much upon his initiative. In the year after he left to teach at Buhler High School, 1942-43, Moundridge High School did not field a debate squad. Bill Juhnke also put a lot of time and energy into the Hi-Y club, a boys' student Christian organization. The Hi-Y "motto" was "to create, maintain, and extend high standards of Christian character throughout the school and community." The club met once or twice a month for special programs, Bible study, musical events, and topics of current interest. At a meeting on November 3, 1938, Bill divided the members into Democrat and Republican teams and assigned roles for national, state and county candidates. The student newspaper account reported, "the rivalry ran hot, and a slight trace of mudslinging was also noticed. . . . the boys enjoyed many good laughs throughout the program." The Hi-Y club organized special projects such a bookstore for resale of used books and school supplies, and a food stand at the Moundridge community fair. They contributed funds to sponsor an underprivileged boy at the Kansas Boys Industrial School in Topeka. In May 1939 at a Hi-Y picnic "nearly eighty-five fathers and sons enjoyed an afternoon of jolly recreation . . . at Ed Krehbiel's farm on the Turkey Creek." They played ball games, horseshoes, and went fishing, swimming and motorboat riding. That same month the Hi-Y sponsored a performance of a three-act "farce comedy" titled "Here Comes Charlie." The play was produced by the Elyria drama society, and Bill played a lead role as "Aleck Twiggs, an Ozarkian who was turned into a butler." On a number of occasions Bill invited the Hi-Y cabinet to his home to eat Meta's cooking and to plan programs. The Hi-Y clubs in Kansas high schools were connected through district conference meetings and summer camp at Camp Wood near Elmdale. Fund-raising projects helped pay expenses for members who attended summer camp. Bill took delegations of students to district conferences. In September 1939 he and seven Moundridge boys attended summer camp at Camp Wood. That fall Bill was elected a Hi-Y district councilman, and the next year he helped host the district Hi-Y conference in Moundridge, attended by 100 boys from twelve Hi-Y clubs. The speaker at that event, Danny Lay, reported that the national Hi-Y conference in Ohio in 1940 passed a provision "that the 1,100 boys would refuse to fight in Europe, but only help defend the western hemisphere." In the fall of 1941, Bill passed the role of Hi-Y sponsor to his teacher colleague, Art Baltzer. The next year, at Buhler High School, Bill again served as faculty Hi-Y sponsor, although the club in Buhler apparently was not as large and as active as the one in Moundridge. Meta & Jimmy on the K.U. Bill, accompanied by Meta, went to Kansas University in Lawrence for the summer sessions of 1939, 1940 and 1941 to work on a master's degree in educational administration. Moundridge High School helped with expenses by offering a seventy-five dollars scholarship per session. For the first two summers Bill and Meta were in the same second-story apartment on Ohio street. Every day Meta went on a walk to the park where Jimmy could play on the swings and she could read the Civil War novel, Gone With the Wind. Perhaps it was while she was reading the novel that Jimmy took the family silverware and deposited it under the house through a hole in the foundation. Meta also attended bridge-playing parties with other student wives, and played tennis with Bill and Jimmy on the K.U. tennis courts. She tried to help Bill with his statistics course--his most difficult course--and listened to his enthusiastic reports about his educational philosophy course with Professor E. E. Bailes. Each summer they drove home for the extended Independence Day vacation. Sometimes that enabled Bill to help at least a bit with the wheat harvest.